In June, Seattle Cares received a $300,000 grant over three years from King County’s Best Starts for Kids program. 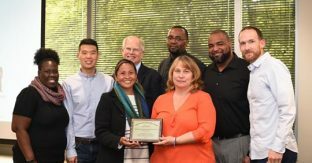 Seattle Cares is one of 32 awardees that will provide school-based programs and opportunities to promote healing and create a school culture and climate that honors the unique strengths of young people. Seattle Cares will work with Denny International Middle School in West Seattle and Meany Middle School on Capitol Hill, training and deploying mentors who will meet with students during the school day. These sessions will allow students to build self-confidence and feel supported by their school and their community. Participating students receive the message that they are smart, intelligent and capable of learning. Mentors who volunteer in the Our Best program are helping change young lives forever. Mentoring is not an abstract concept or an educational approach. It’s about real people helping the next generation of Seattle youth succeed in high school and in college, changing their lives forever. Take De’Shaun, who graduated this spring from Rainier Beach High School. De’Shaun is a gifted athlete and was on the Rainier Beach football team that competed in the state championship. 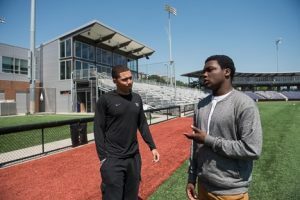 De’Shaun was mentored for more than two years by Channing, another gifted athlete at the University of Washington who recently graduated with a degree in political science. Channing was there for De’Shaun, serving as as a role model, tutor and friend. He encouraged De’Shaun and was able to show through his own personal story that a college education was within his reach. 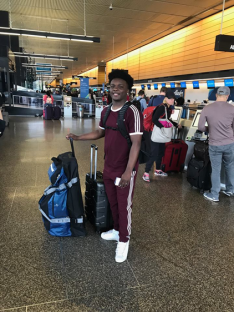 This summer, De’Shaun boarded an airplane for the first time and flew to Dallas, Tex., where he is enrolled at Paul Quinn College, a private, liberal arts, historically black college. He is the first in his family to go on to college. Do you want to change lives? Learn what’s required to become a mentor. 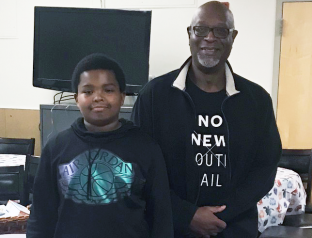 Seattle was among the first in the nation to pilot My Brother’s Keeper, a mentorship program that has helped improve attendance and academic achievement among the city’s black youth. The program rolled out in 2014 at Aki Kurose Middle School, and two years later, has expanded to four other middle schools: Denny International, Mercer International, McClure and Washington. My Brother’s Keeper is one of a network of 19 partners aligned with Seattle Cares Mentoring Movement. Both programs work to give at-risk youth the attention and resources they needed to be academically, emotionally and socially successful. In My Brother’s Keeper, mentors meet with students twice a week for 1 1/2 hours. Although the program is tailored to meet the needs of individual students, the objectives remain the same: To provide academic guidance and emotional support, and to impart critical life skills such as communications, decision-making and dealing with bullying. The success of My Brother’s Keeper has been recognized statewide when the program received the Washington Association School Administrators award for excellence. 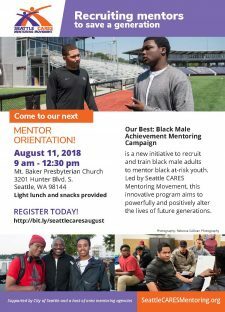 As the new school year gets underway, Catague hopes to increase the number of students participating in My Brother’s Keeper and to recruit more mentors through its ongoing partnership with Seattle Cares. Learn more about our partnership network here.